Umberto Pelizzari needs no introduction. He is, in no uncertain terms, a legend in the freediving world. 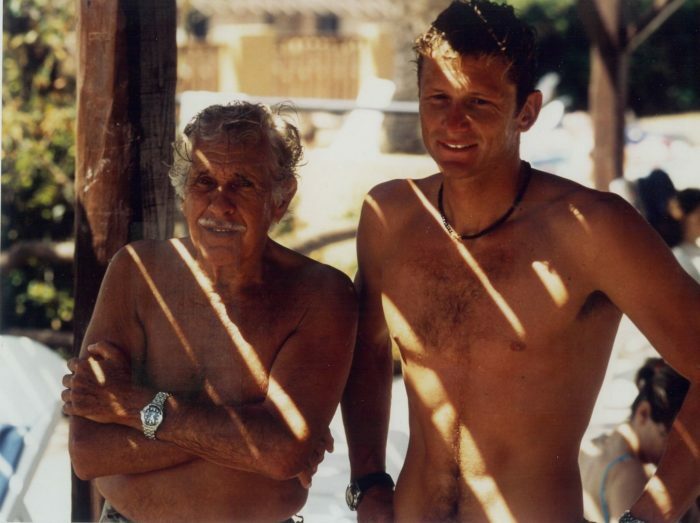 Having himself trained under one of the original freediving greats, Jacques Mayol, Umberto would set sixteen world records – on sixteen attempts – during his competitive years. Not only this, these dives were performed without the techniques used today to facilitate equalization at deeper depths (‘mouthfill’ and ‘packing’) – including his 1999 world record in No Limits (NLT) to 150m. And equally impressive: his constant weight (CWT) records were done with bi-fins, rather than the faster and more powerful mono-fins used largely today. 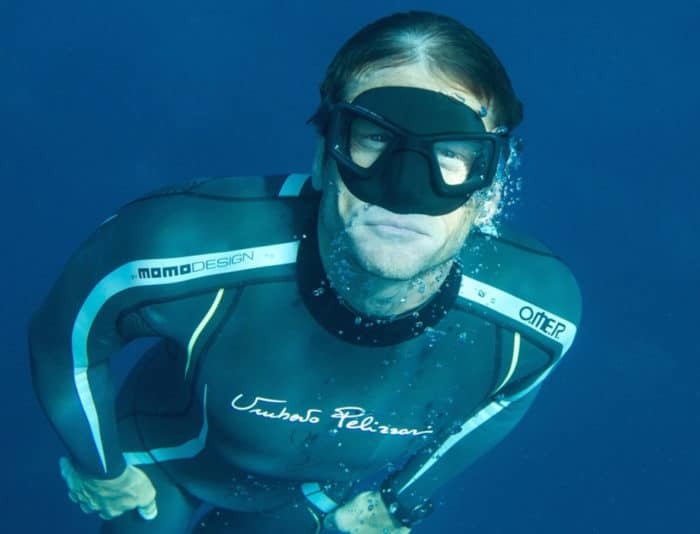 During those years at the forefront of freediving, Pelizzari had a well-publicized competitive rivalry with Cuban freediver Pipin Ferreras, documented in the 2001 film Ocean Men. This rivalry undoubtedly led to the furthering of the limits of what was considered to be humanly possible within freediving, at that time. That same year (2001), Pelizzari retired from competitive freediving, holding the world records in Constant Weight (CWT), Variable Weight (VW) and No Limits (NLT) – in other words, he had WRs in all the disciplines of freediving that existed at that time. 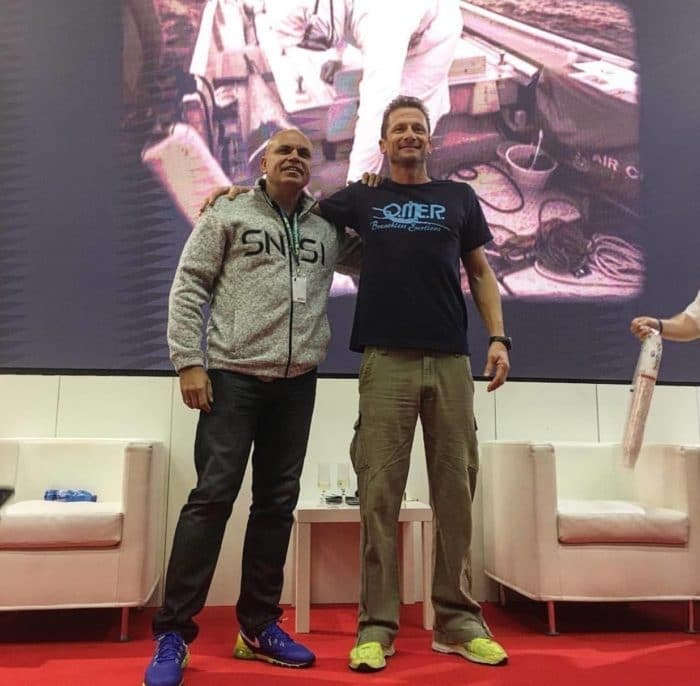 In a career spanning 30 years, Umberto has remained a significant part of the freediving world after leaving the competitive field due, in a large part, to the founding of Apnea Academy – the highly respected freediving education association. Umberto continues to run Apnea Academy instructor training and is a professor in Hyperbaric Medicine at the Scuola Superiore Sant’Anna di Pisa, as well as a motivational speaker, TV journalist and proponent for the protection of ocean environments. He has also authored or co-authored 14 books on freediving – one of which, The Manual of Freediving Full Disclosure: We earn a commission if you click this link and make a purchase, at no additional cost to you.  , is widely considered to be the bible of freediving training. Read on, for a fascinating interview with this passionate and articulate waterman, athlete, author, professor, teacher, spearfisherman. Umberto Pelizzari: I don’t know if it’s inspiration. When you really live freediving and it is part of your life, you understand that you never stop learning. You never stop learning how to improve your technique, how to improve the teaching techniques for your students. You understand you can increase the sensation you have when you freedive. So it’s continuous research. That’s why I’m never bored of freediving, If you ask me what I want to do tomorrow, I’ll say I want to go to the sea and freedive. This is what I like and I started 40 years ago. So I don’t know why I have this instinct, this energy for freediving. It’s for many reasons: for research on myself; to understand more so that I can help my students to find the easiest solutions to their problems; to live particular sensations that you can only feel in your body when you dive and hold your breath. This is why I go on with this research, and freediving is the most important part of my life. UP: As an athlete, as a person, I consider that Herbert Nitsch is the greatest of all time. He was at the top in all disciplines, he wrote new pages on equalization, he was really strong in different disciplines. So I have a strong admiration for him, especially after his accident, he was able to start going into the water again and living his new life. I like him as a freediver but also as a man. But I also like the ‘world’ of freediving. I’m out of competitions myself, but every time I meet new freedivers, traveling or training, I understand that we have something in common, because of the sport we practice. We are crystal inside. It’s something that I only feel with freedivers, not with football players or whatever. It’s something that belongs to you, which draws you to freediving, or it’s something in freediving that increases this special quality that is found in freedivers. This is what I like in our world. UP: I love spearfishing, and for me, spearfishing is the Mediterranean sea, because it is particularly difficult, it’s a big challenge with the fish. Sometimes you stay hours in the water and you don’t catch any fish, so it’s what I like. For the combination of spearfishing and freediving, I love the north of Sardinia and Corsica, but I also love Greece and Sicily as well. I feel the Mediterranean in my body. I was born in the Mediterranean as a freediver, so I have a strong attraction as a freediver for the Mediterranean. Even when I was competing, and I was obliged to train in winter when the Mediterranean is cold, I was in the Caribean, Red sea, but as soon as I could I would return to the Mediterranean to continue training because I love the Mediterranean sea. 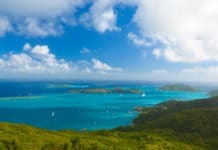 UP: I’ve never been to Australia, so I’d like to visit the Great Barrier Reef. I have Australian friends who are spearfishermen, and who spearfish there. For just freediving, I would like to go to Guadalupe Island in the Pacific coast of Mexico, for the big white sharks. That is my dream. Three times I dived with white sharks in South Africa, but always in a cage because the water was dirty, with no visibility. I was told that in Guadalupe there is good visibility and it would be better for open water encounters with the great white shark. That’s my dream for freediving. UP: I think when you are a beginner, more than talking about training, in my opinion, it’s much more important to be able to feel your body. To feel when your body is really relaxed in the water. Sometimes I have students, and we go to the water, and I tell them that rather than the performance, the goal is to relax your body, and then they discover they are not relaxed. They think they are, but when you help them, they understand what is real physical relaxation. I think the first step is reaching this point: feeling your body, relaxing your body, because especially at the beginning, freediving is relaxation. To be able to have good sensations underwater, to recognize and eliminate mistakes, relaxation is the key to solving many problems and having good feelings. UP: I think, out of the water, functional training methods are good for freediving. Now, we know that functional training is important, that can be CrossFit, what I do is TACFIT, which is very good. In the beginning, when I was training, I was doing more endurance training, and I discovered in myself that functional training is much better than endurance. So I think this is the direction we have to move when we decided to train out of the water physically. When I wrote the first edition of the Freediving Manual Full Disclosure: We earn a commission if you click this link and make a purchase, at no additional cost to you. , about 18 years ago, I was writing about this method of training, like running holding your breath, or gym circuits holding your breath, and at that time, everyone was telling me that was not good for freedivers, and not I’m happy that nearly 20 years later, 90% of freedivers are following this kind of training. UP: If you have to go spearfishing and you have many hours in the water, I have breakfast because I need energy for endurance for all the time in the water. It’s important to recognize what is easy to digest for you, it depends on each person. It’s important to have the storage, the calories that you use during the spearfishing activity. What has made a big difference for me, which I didn’t follow before and now I feel much better in the water, is drinking more or less every hour just the quantity of a glass of water, and every two hours I’ll eat some dried fruit, or fruit, or bread, or honey. Every two hours I try to eat something, not too much, but I try to avoid completely using up all the energy. When I go for freediving training, 3-4 deep dives, or just one warm up and then deep, I prefer having my stomach completely empty. This was the same when I was training for competitions. UP: Nothing! I like Italian food. I try to avoid fried food, butter, but I don’t have any strict diets, I’m not vegetarian, I’m not vegan, and I think it’s important to eat a bit of everything. It’s important to understand your own body and to find out what is good for you and not good for you. I’m living in Sardinia, where we have the biggest community of centenarians in the world, people over 100 years old. The base of their food is cheese and meat. Originally they were not fishermen, they didn’t live close to the coast, but in the interior, they had sheep, goats… They don’t follow what doctors say like you have to avoid meat, white bread, fat, flour. I like eating, it’s a pleasure of life, it’s stupid to be, you know “militant”… food is a pleasure. The thing is not to exaggerate. It’s difficult to say ‘this food is good, this food is bad’ it depends on your body and you have to be able to listen to your body. This, I think, is very important. UP: I have many lessons from freediving. I could go on for hours! One quality that you learn from freediving and the sea is humility. If you are not humble in the sea, you die. So the first of many lessons is this: being humble. 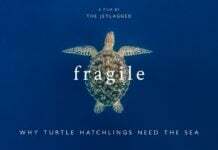 Respect the sea. For me freediving is peace, it’s freedom, it’s connection with your body, it’s self-control. These are other, let’s say, lessons. But being humble is the first quality of the lessons. UP: Ahhhhh… I’m hoping that I’ll still be in the water! I think I will go on freediving and spearfishing until my body doesn’t let me go underwater. So I hope to still be able to do what I can do now. Last year I was able to spearfish deeper than the previous season, so that’s a good goal. I’d like to be able to increase this, and I think I will be in the water until my body tells me, “now it’s time to stop”. I will respect it. But in the next 5-10 years, I expect to still be in the water! UP: There are many… Probably my World Record to 150m [No Limits, 1999, Liguria Italy], because I increased the depth. The previous one was 138m, and I chose the number 150 because the 50m was by Enzo Maiorca, 150 was Jacques Mayol, and I wanted to be the first to get my name close to that number. But it’s not only for the depth but also for the way I did it. Because I had only one training for that dive, and I broke my eardrum at the max depth because of a mistake with equalization. 90% of my training was in Constant Weight (CWT) because I think that when you are ready to dive in Constant Weight, you are ready physically and mentally for Variable (VWT) and No Limits (NLT). So I did the 80m Constant Weight record in Liguria, Italy and my dream was to establish the record in No Limits, but the sea was getting rough, there was a big storm coming. So we had no time for two records, so we decided to do just the 150m. But I had to train that depth because 150 was important for the equalization. The sea was rough and we decided to do the only training we had during the night when the sea is calmer. The idea was to dive to 130m, to equalize at that depth, because that depth represented for me the last depth I would need to equalize. That would be my last equalization to be able to get to 150. So that dive was around 11-11.30 pm. It was completely black, I love it, like that, my body in the sled completely covered by starlight. The idea was to dive to 130, equalize, and stay 30 seconds at the bottom, then come back with the balloon. And I remember that when I arrived I felt my right drum was OK, but I had to force for the left eardrum to clear. I forced a little too much, and then I felt like a whistle, but I didn’t know why. I stayed for 30 seconds at the bottom, then went back to the surface. I felt something didn’t feel right with the eardrum, and I had to stay 2 more hours for the safety [scuba] divers to surface. So I asked the doctor to check my drum, and they said it was red but didn’t see anything bad. We went back to the hotel around 3.30am, and in the morning we wanted to try the record, but the sea was very rough and it was impossible to dive. So I went to the pool with my trainer and my doctor and equalized underwater, and bubbles came out, so I had broken my eardrum. My doctor didn’t want me to dive again, but I convince him to respect me and my training, and that it wouldn’t be a problem. When I tried the record the next day I was completely charged, mentally. I was in the worse condition for a freediver with a broken eardrum, but mentally completely charged, positive, and I didn’t do any warm-up dives to not stress the eardrum. At the five-minute countdown, I went on the sled, and I was talking to myself, and it was very good. Bad conditions but problem solved in the best way, by charging my self, talking to myself and that was, I think, the most memorable and significant dive of my career, not only for the depth but for the way that I did it. UP: Probably Apnea Academy. 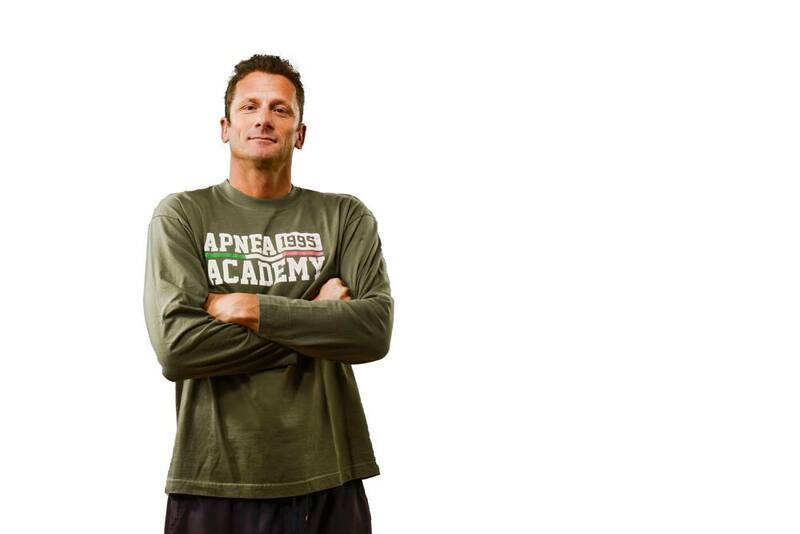 It’s my creation – not only mine – I was one of the founders of Apnea Academy, with other instructors. And now AA is the biggest school in Italy, which is one of the biggest freediving markets in the world. It is very strong in Europe and around the world, and we are proud of it. To become an instructor is difficult, we have a big selection to consider, we only do one instructor course every two years, in Italy (we do international courses too) – the next is in Sept/Oct 2018 – we have more than 190 candidates to get through the selection and we take only 60, to maintain the quality rather than to increase the number of instructors, so we are happy with it. And I think when we started this adventure altogether, called Apnea Academy, no one believes we could reach this level. I’m proud of it because we are not a multinational company, we are a group of friends, motivated by a common passion, and I think many multinational companies would like to have the performance of Apnea Academy, that’s why I’m proud of it.